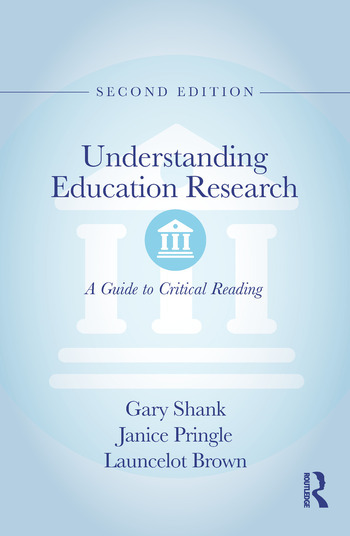 Understanding Education Research, 2nd Edition is designed to help students learn to read educational research articles carefully, systematically, and critically. Readers will learn how to categorize titles, decode abstracts, find research questions, characterize research arguments, break down methods and procedures, explore references, apply analysis strategies, and interpret findings. This textbook and quick reference guide allows students to easily develop the skills they need to become research literate and the 2nd edition has been updated throughout to offer simple guidelines for qualitative, quantitative, and statistical approaches and up-to-date information on complex and confusing methodologies. Gary Shank is Professor of Education at Duquesne University. Janice Pringle is Associate Professor of Education at the University of Pittsburgh. Launcelot Brown is Professor and Chair of the Department of Educational Foundations and Leadership at Duquesne University.